PMJ combines magnetic strength and aesthetics.﻿﻿ People, young and older, who see us at shows, constantly compliment us. "Beautiful!" "I've never seen magnetic jewelry like this ." "So many beautiful choices!" We hear these and similar comments all the time, and it feels good. Our goal is to make Therapeutic Jewelry that doesn't look therapeutic. These reactions tell us we're doing our jobs well. Each piece offers health benefits which have been verified by the tests of both time and medical professionals. Our Magnetic Jewelry is a means to a better, more comfortable life-style for our clientele. Just look at our Customer Endorsements page, or visit us at a show and see how many customers come back to us to purchase items for friends and family members. Our prices generally range from $5 to $50. We offer discounts for Military, Police, multiple item purchases, and sometimes just because ... Pricing for custom orders is sometimes negotiable as well. ﻿All of the above are true because we care about our customers. We're not getting rich (by any stretch of the imagination!) buying cheaply made items overseas and reselling them at 1000% markups. We work at our craft and we want you to appreciate our jewelry, and hopefully us too, every time you look at it and realize what it is doing for you. You live a more comfortable life, we take satisfaction in knowing we have helped. This is the Original PMJ Signature Series Bracelet in turquoise. The black stones making up the bulk of the piece are Magnetic Hematite. 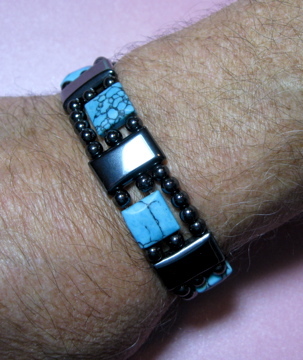 The number of Magnetic Beads on this item make it a very potent bracelet. Be sure to include your precise wrist measurement when ordering and we will size the bracelet accordingly. This item is also available using other gemstones on our "Products" page. Shipping will usually be within two days, but please allow up to three weeks in the event of unforeseen circumstances.